Monsieur et Madame Ernest Rouart, Paris. M. Angoulvent, Berthe Morisot, Paris, no. 501. M. L. Bataille & G. Wildenstein, Berthe Morisot, Catalogue des Peintures, Pastels et Aquarelles, Paris, 1961, no. 277 (illustrated, fig. 269). A. Clairet, D. Montalant & Y. Rouart, Berthe Morisot, 1841-1895, Montolivet, 1997, no. 278 (illustrated, p. 252). Paris, Galerie Dru, 1928, no. 14bis. Paris, Galerie Charpentier, 1951, no. 44 (illustrated). Jeune fille cueillant des cerises, painted during the summer of 1891 at Morisot's house at Mézy, belongs to a series of works that culminated in the celebrated Le cerisier (Clairet 281). 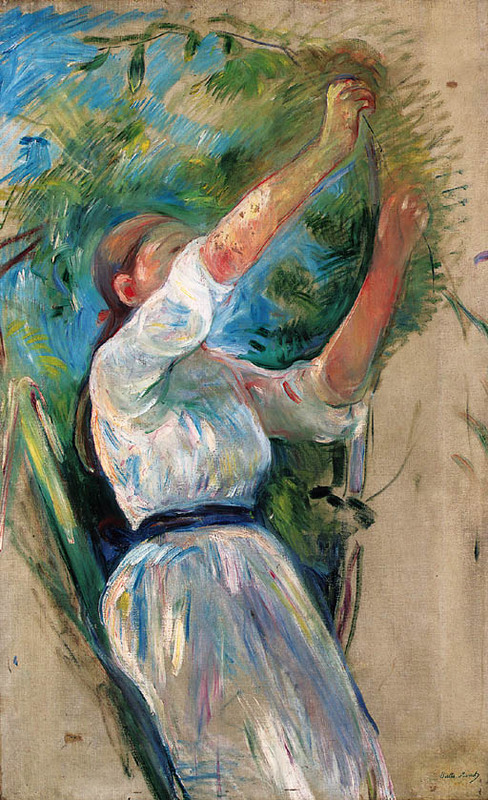 In the present work, Morisot has concentrated on the figure of her daughter, Julie Manet, balancing on a ladder and reaching up into the branches of the cherry tree.